Fusion is the merging of two or more styles of music, and can be applied to grooves on the bass guitar. Fusion generally refers to the combination of rock rhythms and jazz harmonies, but any combination of styles is possible. Fusion-style bass playing is intricate and complex, and full of nervous energy and fast notes; its deep grooves allow you to really rock the joint. This is a busy fusion-style groove that you can play over either a major or dominant chord (Ionian or Mixolydian mode). Notice the use of dead notes and the chromatic tones that make the groove more interesting. Start the groove with your middle finger; no shifts of the left hand are necessary (or desired). The groove is extremely busy, hitting all 16 of the sixteenth notes in the measure. 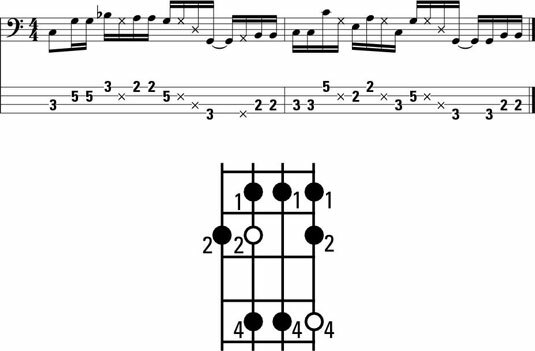 This fusion groove is challenging to play, so take your time with it. The ease with which you’ll be able to play it in a band will be well worth the extra effort now. This fusion-style groove is for a dominant chord (Mixolydian mode). Start this groove with your middle finger. Many fusion-style tunes have an extended section of just one chord. With this type of tune, you don’t have to move your groove from chord to chord. You can use a groove that covers all four strings of your bass to really expand your harmonic range. This groove, which is based on a Mixolydian mode (for a dominant chord), requires no shifting if you start it with your middle finger. It may take a bit of effort to get it under your belt, but it’s well worth it. Fusion grooves can be incredibly busy and complex while still having a fleeting feeling about them. They seem light and kind of skip along. To achieve this effect, pepper your fusion grooves generously with dead notes, which lighten up the wall of notes and give your groove some much-needed dynamic variety.